James Hudson Taylor (1832-1905) was an English missionary to China. Founded the China Inland Mission which at his death included 205 mission stations with over 800 missionaries, and 125,000 Chinese Christians. Life and Ministry of James Hudson Taylor. by Ed Reese. J. Hudson Taylor. Short biography. James Hudson Taylor. Founder of China Inland Mission. J. Hudson Taylor: God's Mighty Man of Prayer. J. Hudson Taylor: Founder of China Inland Mission. J. Hudson Taylor, Founder of the China Inland Mission. Hudson Taylor: Pioneer and Builder. Hudson Taylor of the China Inland Mission. Rev. J. Hudson Taylor. Short biography. 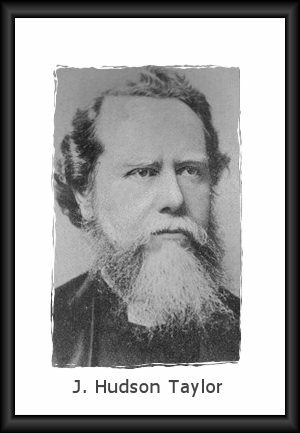 Conversion of J. Hudson Taylor: Founder of China Inland Mission. The Exchanged Life. Letter by Hudson Taylor to his sister Amelia. Hudson Taylor. Short biography for young people. Hudson Taylor. Chronology of his life. Echoes from Glory. Selective sayings/portrait of Taylor. Maria Dyer Taylor (1837-1870): Daughter of one of the first missionaries to China, she was orphaned at the age of 10. She was a missionary to China when she married Hudson Taylor, January 20, 1858. They had seven children: Grace, Herbert Hudson, Frederick Howard (who would later co-author Hudson's biography), Samuel, Maria, Charles Edward, and Noel. Being fluent in the Ningpo dialect, she helped Hudson with translation work. They had been married for 12 1/2 years when at 33 yrs. of age, Maria died of cholera in 1870. She was a "tower of strength" and a comfort to her husband. In her own words, she was "more intimately acquainted than anyone else can be with his trials, his temptations, his conflicts, his failures and failings, and his conquests." Jennie Faulding Taylor (1843-1904): Another CIM missionary, she became the second wife of Hudson Taylor in 1871. They had two children (a son, Ernest, born in 1875 and a daughter, Amy, born in 1876), plus the four from his previous marriage and an adopted daughter. Jennie cared for her husband through injury and illness, edited the periodical China's Millions for the China Inland Mission, had a special ministry among the women. In her later years she traveled with Hudson Taylor, speaking, writing, and organizing the work of the Mission. She died in 1904, preceding Hudson Taylor who died in 1905. Hudson Taylor's Spiritual Secret (Moody Classics) by Dr. & Mrs. Howard Taylor. Chicago, IL: Moody Press, 2009. First published in 1932. It is Not Death to Die: A New Biography of Hudson Taylor by Jim Cromarty. Fearn, Ross-shire: Christian Focus, 2014. Reprint. First published 2001. Hudson Taylor by J. Hudson Taylor. Minneapolis, MN: Bethany House Publishers, 1987. Autobiography. Also issued under title A Retrospect.